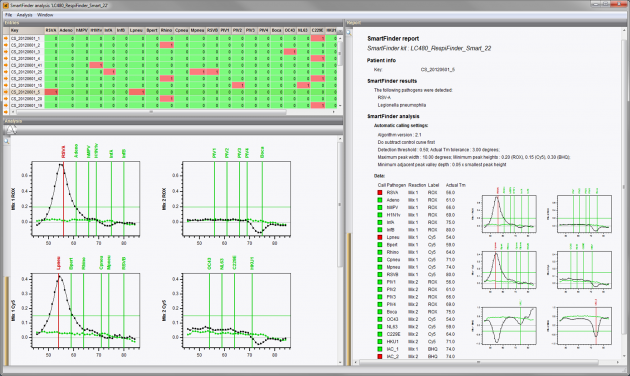 The SmartFinder® technology, developed by PathoFinder B.V. uses specific probes which are ligated after hybridization to their respective target gene and subsequently amplified and identified by melt curve analysis on a real-time PCR instrument. In the assay, the SmartFinder reaction is preceded by a pre-amplification step with ensures the detection of the pathogens with the same sensitivity and specificity as singleplex Real Time PCR. A SmartFinder plugin tool has been developed in BioNumerics for the analysis of SmartFinder melt curves, obtained from different kits, e.g. the RespiFinder® SMART 22 assay for the detection of viral and bacterial respiratory pathogens. The plugin accepts melt curves from LightCycler 480 (Roche) and Rotor-Gene (Corbett / Qiagen) instruments and provides a high degree of automation, from the import of raw melt curve data, to clear reporting of results and indication of problem cases. BioNumerics’ extensive databasing capabilities allow for integration with laboratory information management systems (LIMS), user management and audit trails, making it a valuable tool for high throughput analysis and for use in hospital settings, where reporting and integration with other systems is often required.